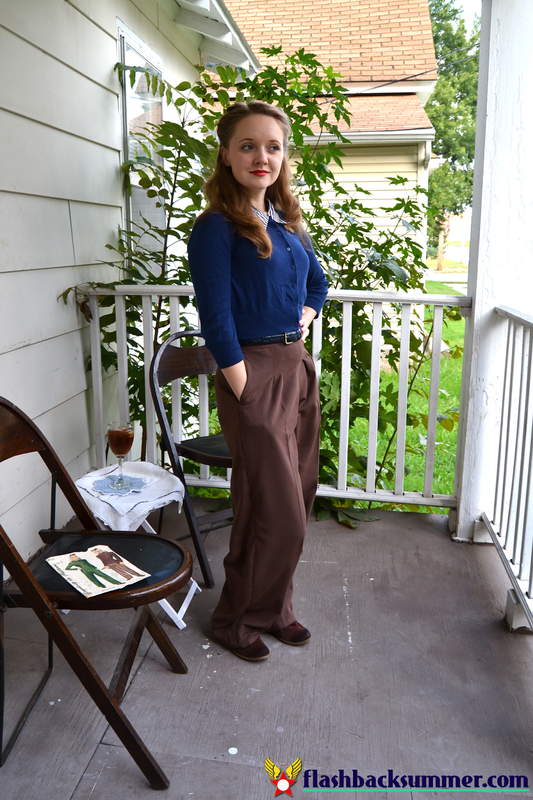 Trousers seem to be the pieces in a vintage wardrobe that constantly elude us vintage wearers. They're hard to come by (in comparison to, say, dresses), pants are more difficult to fit correctly, and they are expensive in the repro world. I walk to work. I run up and down the stairs of my office building. Sometimes my legs are cold. Sometimes I haven't shaved. Sometimes I just don't want to wear a skirt. I need trousers! Finally, after realize that I have no office-appropriate pants (aka, my two pairs of jeans aren't allowed, except on Fridays), I decided that I had to do something about it. Repro, like I said, gets expensive (and the sizes don't usually fit me because I'm so short), so I went the me-made route. I went to a pattern shop on Etsy that I frequent: Midvale Cottage. I've bought things from the owner, Kathleen, before, and she is great to work with. (I bought this Vogue robe pattern from her as well!) Her patterns always arrive in perfectly fitting plastic sleeves which I keep the patterns in while I store them to keep them safe. 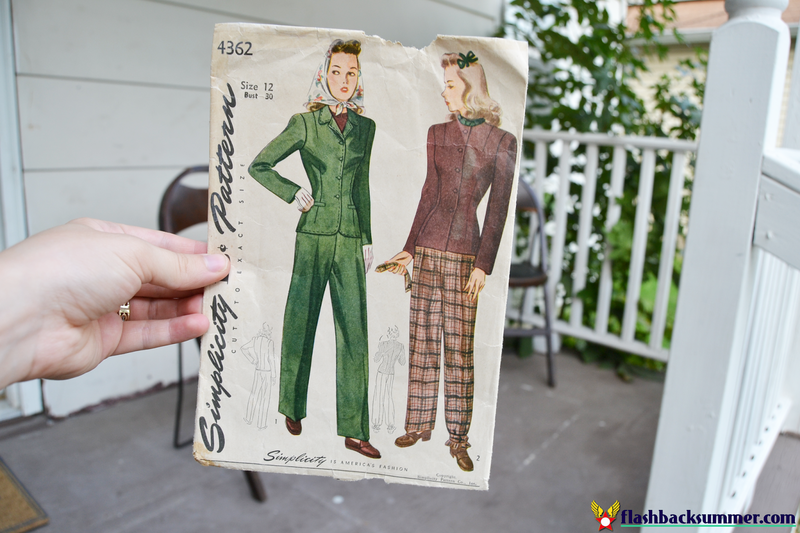 Her shop is also beautifully curated with almost 350 patterns in just the 10s-40s and 50s sections right now. Personally, I'm a sucker for the unique older patterns, and that's just what she's got! So, I decided on Simplicity 4362 and a couple neutral, yet comfy and wrinkle-resistant fabrics to work with. 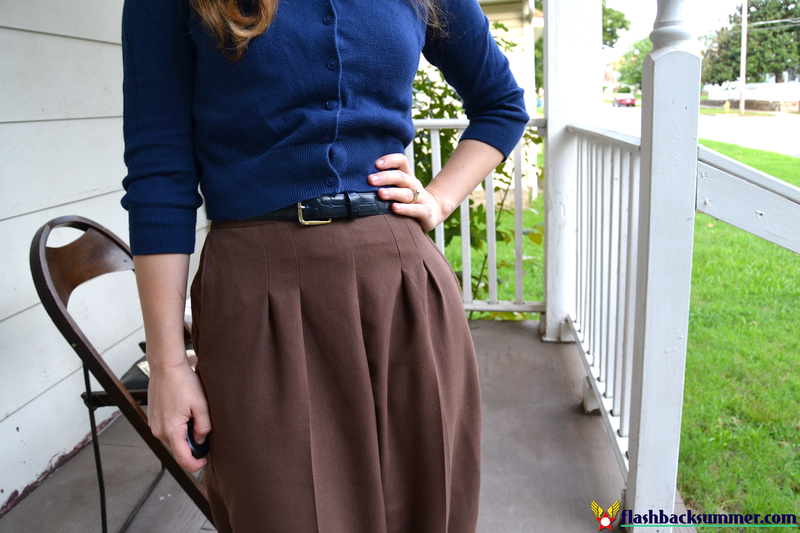 (This post will feature the brown fabric; another color will be featured soon.) Look! The pattern even has BICYCLE STRAPS! Fabric: Cotton with a twinge of polyester, I think. How historically accurate is it? Pretty accurate! I didn't use a metal zipper, and I think the scrap cloth I made the pocket out of may be synthetic. The shape of the garment itself, though, is totally accurate! Any tricky parts to the pattern? Just general fitting, but most pants patterns need that. Did you change anything? Yes, I had to shorten the pattern (shocking? No. ), and I widened the hips and decreased the rise to have a longer inseam. It helps me not look as short! Notes: Seriously, make a muslin. Figure out the fit you want first! Midvale Cottage Etsy Shop is a sponsor of Flashback Summer for the month of September 2014. I was compensated for this post through the purchase of a sidebar ad, but all thoughts and opinions are my own! Your pants look amazing and truly inspire me to want to make my own. I don't know why, but sewing up pants for myself scares me. Also your fabric looks perfect for those pants. Thank you very much, Sarah! 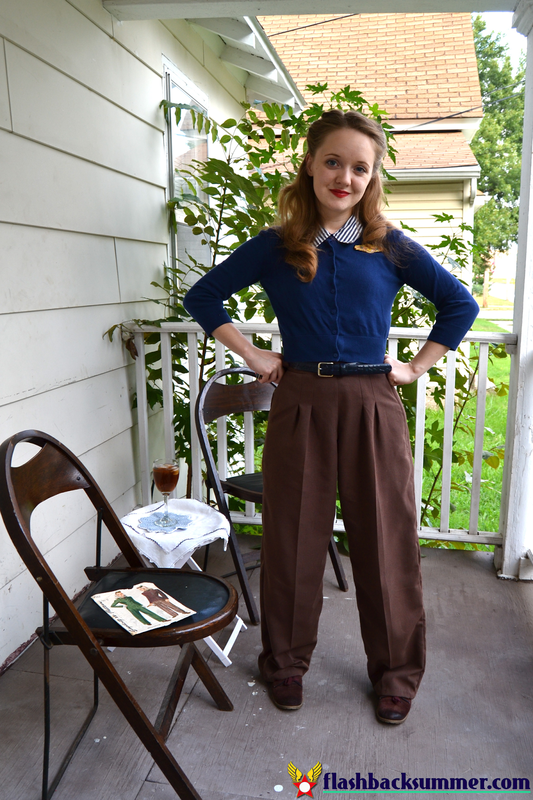 Pants totally scared me too, but I'd highly recommend doing a 30s-40s, baggy, wide leg style. They aren't so difficult to fit as, say, cigarette pants (which I did first... very obnoxious). Pants aren't actually TOO hard, I will say! They all pretty much have 4-5 main pieces and thats it! Wow! The pants turned out beautifully! You achieved a perfect fit and the pants look great. I am happy to hear that the construction challenges were essentially the "usual" - i.e., related to fit. Kudos on another successful sewing project! I look forward to seeing your future planned projects for this pattern. And thank you for this wonderful write-up of my shop, Midvale Cottage on Etsy - I love my little shop and enjoy providing vintage fashion inspiration from decades past to terrific seamstresses like yourself. I love these trousers, you did a fabulous job. 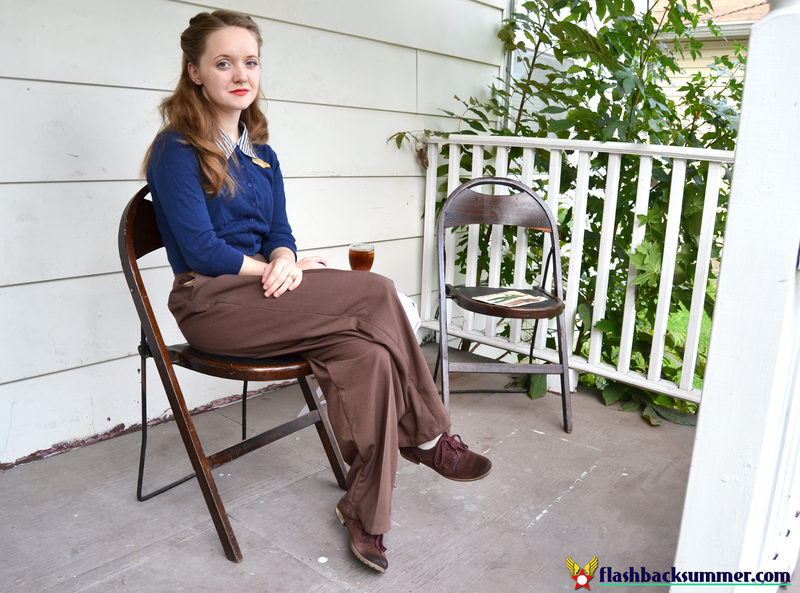 Living in Alaska, I just can't wear dresses every day so I'm always looking for vintage appropriate trousers. Sure wish I were a better seamstress. Those trousers are lovely! They really suit you and I like the cardigan you have paired them with. I totally agree with you about the price of reproduction clothing and the issue with fit. I have had many a rant about it myself in the past. I'm just about to start making some capri pants. Ooo, those are both good patterns to try! I'm sure you could do it! Oh those trousers look fantastic!! And I adore the cardigan you paired with it! 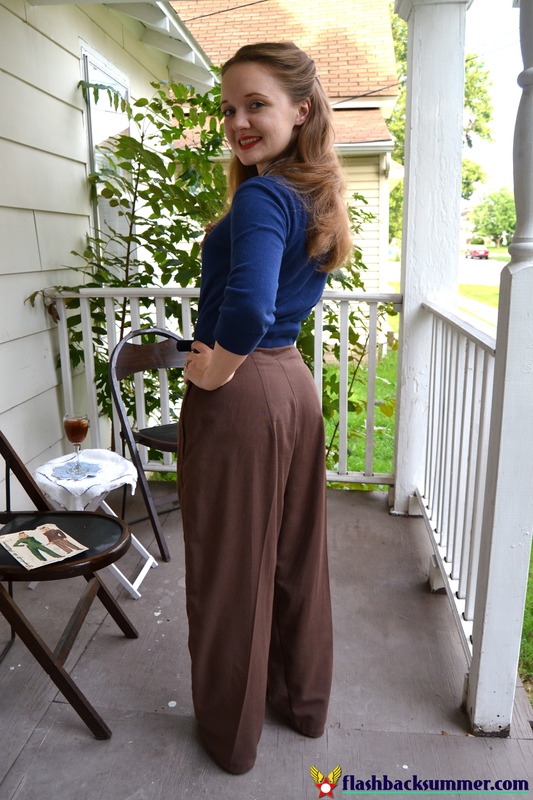 I need to make myself some more trousers from my vintage patterns, but I'm too lazy to have to widen the hips on them. Ah well, I have to do it! Yeah, I had to widen the hips on these too! I totally understand! Those pants look quite smart on you! Beautiful job! I absolutely must learn to sew. I have been combing the stores looking for a good pair of high waist, wide leg trousers, and I can't find anything that fits. Your pants look fantastic, and given that the actual monetary outlay was only $28, they're quite a steal as well. Sizing issues and budget are actually why I learned to sew! I really recommend it. It comes in crazy handy.